Last week, I featured Kathleen Kent’s fascinating novel The Heretic’s Daughter, which tells the story of her ninth great-grandmother, Martha Carrier, who was hanged as a witch in 1692 as part of the Salem Witch Trials. Fourteen women and six men were executed as suspected witches, one by being “pressed” to death with large stones, the rest by hanging. Many theories have been offered over the centuries for this heinous treatment of Salemites by their neighbors. What originally began as hysterical accusations by young girls quickly swept Salem and surrounding villages. Neighbors pointed fingers at neighbors, often those whom against they had long held grudges. No one was safe. 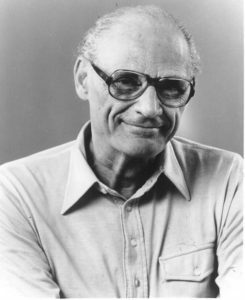 American playwright Arthur Miller – who was born 101 years ago today – saw parallels between the Salem Witch Trials and the McCarthy communism hearings of the 1950s, which came to be known as “witch hunts.” Led by Senator Joseph McCarthy, the hearings targeted numerous people McCarthy claimed were Communists and Soviet spies and sympathizers inside the U.S. federal government and in other circles. Miller – himself convicted of contempt of Congress for refusing to name others who had been at meetings he had attended – knew all too well how accusers could band together, circle the wagons, and exclude and point fingers at those whom they feared. As Americans from all walks of life were called in to testify before the House of Representatives Committee on Un-American Activities, they were grilled not only about their own suspected Communist activities but – even more frighteningly – asked to name names. Who among their relatives, friends, and acquaintances did they suspect of being disloyal to the United States? The McCarthy witch hunts particularly targeted Hollywood and other areas of the arts. Producers, directors, screenwriters, composers, writers, and far too many actors to name were accused of being Communist sympathizers. And in 1950s America, branding someone as a Communist sympathizer was indeed equivalent to the Puritans targeting a neighbor as a witch. Well-known performers and artists who were “blacklisted” include Charlie Chaplin, Burl Ives, Langston Hughes, Aaron Copland, Paul Robeson, Will Geer (of “The Waltons”), and even Arthur Miller himself. In many cases, their careers were destroyed forever. You can see a full list of the many creatives who were blacklisted on Wikipedia. It was impossible not to see the striking similarities between the Salem Witch Trials and the McCarthy hearings. So when Arthur Miller sat down to write The Crucible in the early 1950s, he set himself the task of uncovering the reasons why human beings would turn on each other in such a brutal way. Why point the finger at a neighbor or friend, knowing full well that doing so could cost the neighbor her life or land the friend in prison? By 1950, when I began to think of writing about the hunt for Reds in America, I was motivated in some great part by the paralysis that had set in among many liberals who, despite their discomfort with the inquisitors’ violations of civil rights, were fearful, and with good reason, of being identified as covert Communists if they should protest too strongly. Despite his extensive historical research, Miller’s dramatization of the Salem Witch Trials is just that – a dramatization. Much of the play is based on historical research, but some of the key dramatic elements are fictionalized. The protagonist of the play is John Proctor, one of the men who was executed in 1692, and his wife, Elizabeth Proctor, was also accused of practicing witchcraft. It is unlikely, however, that John Proctor had an affair with Abigail Williams. In 1692, she was eleven or twelve years old, while Proctor was sixty when he was hung. What rings true, however, is John Proctor’s vocal opposition to the witch trials: the historical John Proctor was strongly opposed to the trials and was especially dismissive of the “spectral evidence” used in the trials. To learn more about the 1692 Salem Witch Trials, you can visit the Salem Witch Museum or explore an interactive online exhibit at National Geographic. An extensive collection of historical resources can be found at the 17th Century Colonial New England website. And of course, you might want to revisit last week’s post on Kathleen Kent’s novel The Heretic’s Daughter. For a critical view of The Crucible and its questionable presentation of historical fact, see Margo Burns’s essay “Arthur Miller’s The Crucible: Fact and Fiction (or Picky, Picky, Picky).” You can learn more about Arthur Miller’s personal experience with the McCarthy hearings at the BBC’s “On This Day” website. Ready to experience the play for yourself? If there’s not currently a production near you, you might consider reading the stage play . Better yet, check out the 1996 film adaptation of The Crucible, which was written by Arthur Miller himself. It is an excellent way to experience the play. Daniel Day-Lewis’s portrayal of John Proctor is compelling indeed, bringing to vivid life Miller’s hero who must decide, in the end, what his name and reputation mean. Watch:Watch a five-minute clip from the film adaptation of The Crucible. The featured scene shows the hysteria of the court, the pressure to point fingers at others, and John Proctor’s refusal to confess himself to be in league with the Devil. Image Credit: Portrait of Arthur Miller by the U.S. State Department, public domain, https://commons.wikimedia.org/wiki/File:Arthur-miller.jpg. I watched the clip and will start reading “The Heretic’s Daughter” later this week. It’s sad, the harm people do to each other.